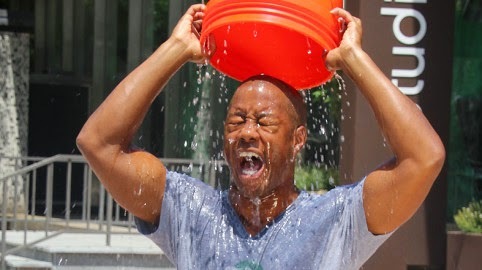 WHAT'S YOUR BEST ICE BUCKET CHALLENGE VIDEO SO FAR? Ice Bucket Challenge is the viral social media campaign which features a roster of A-list celebrities and business leaders drenching themselves in buckets of ice and water, all to raise awareness of motor neurone disease (also known as AIS, or Lou Gehrig's Disease), which affects around 5,000 people in the UK. After each star has filmed themselves enduring several seconds of icy pain, they then nominate up to three more well-known figures to undergo the same public humiliation. Stars who have already participated in this challenge includes Bill Gates,Mark Zuckerberg,Cristiano Ronaldo,Vince McMahon (President of WWE) who has challenged billionaire Donald Trump among his 3 nominations,Le Bron James,Jennifer Lopez,Justin Beiber,Iggy Azelia,Drake and still the challenge is taking over the world. The idea has been traced back to Boston College baseball player Pete Frates, whose promising sporting career was cut short after he developed MND. In 2013, he challenged several Boston Red Sox players to the ice-bucket treatment to raise money and awareness for the condition - individuals can either accept the challenge, or donate an agreed sum to charity (usually $100) - and since then a number of high-profile celebrities have agreed to take part. So far, one of the few individuals to decline the challenge is President Barack Obama who has been nominated by Justin Timbelake,Le Brin James and Justin Beiber.